WHAT is and WHY have an Accountability Matrix? An accountability matrix defines the responsibilities that each role or person has for a given set of things, e.g. : processes, activities, objectives or risks. To help ensure what needs to be done, get done. The fundamentals of an organisation are the division of work. From the moment the very first founder brings on person number 2, an organisation is born. From this point, tasks are divided up. You do x and I’ll do y. As the volume of work, people and complexity increases, this division of work becomes harder and harder to manage. But groups are formed to make it easier again. Operations split from Sales & Marketing. Planning from building… But, there is often a need for multi-disciplinary working. A need to ensure certain things really happen that currently might not be happening. The accountability matrix defines who is responsible for what. Its aim is to provide clarity to everyone. Both the person responsible for any given activity and those around them. A simplified example is shown in the diagram on the left. It has a list of roles, e.g. 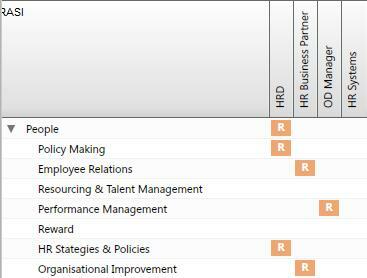 HR Business Partner and a list of processes or activities, or risks, objectives, actions as rows. The “R” denotes who is responsible for what and the “S” for who needs to provide critical support (significant effort) in order that the process can be done. Other letters or numbers could be used. For other letters, see the RAS section. For numbers, it could be number of hours or percentage of time or a simply “x”. These set of accountabilities can be seen in the context of the role – what activities each role is responsible for. This view can provide a sense of what each role is really responsibly for. As I often say, it is what is in the box that really counts, and not where the box sits. It isn’t easy to build an accountability matrix. It requires time to define the processes and activities, to think through the roles and create this link. It can be highly political. When done, cracks are often discovered. Either no-one is currently responsible or multiple roles are. So why bother? Why not just let people sort it out and get on with it? On the one hand, the answer is, you should only bother, at a central level, to do enough. Start at the highest possible level, and cascade down. In fact, yes, let people sort it out at the detailed level until they can’t. Then help. The need to formalise this is driven by the need to have more formal roles, for the need to have career paths and a stronger focus on performance. To be clear, it isn’t just accountabilities for activities. It is equally accountability for achieving objectives, for managing risks or making decisions.